June 20, 2013 July 1, 2013 ~ Bernie K.
A short distance up the road there was another one that cut back to the left. There were two stone pillars, with the gate between them swung open. Passing through the gate, the road dipped down toward Shoals Creek, then fanned out into a parking area that butted up against the creek, with an old-fashioned gasoline pump standing to one side. The roads were so shrouded in trees that you couldn’t see the sky. We stopped and got out of the car. 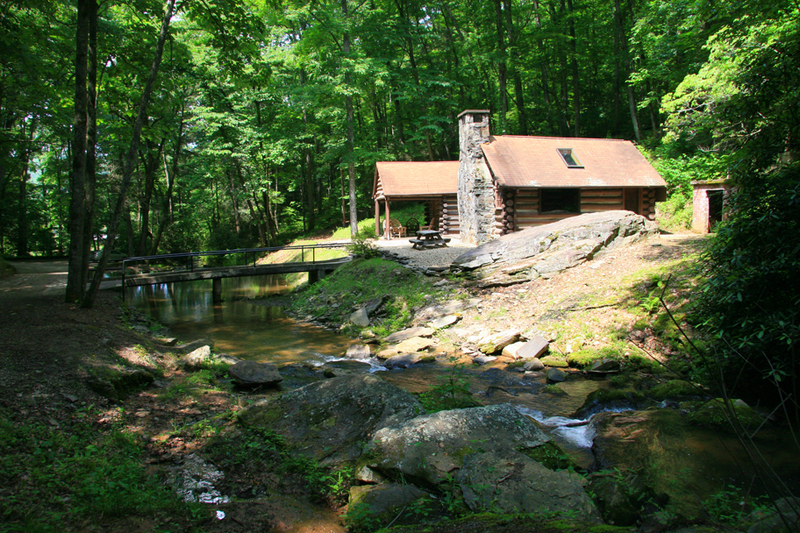 There across the creek was the log cabin that would become my home. 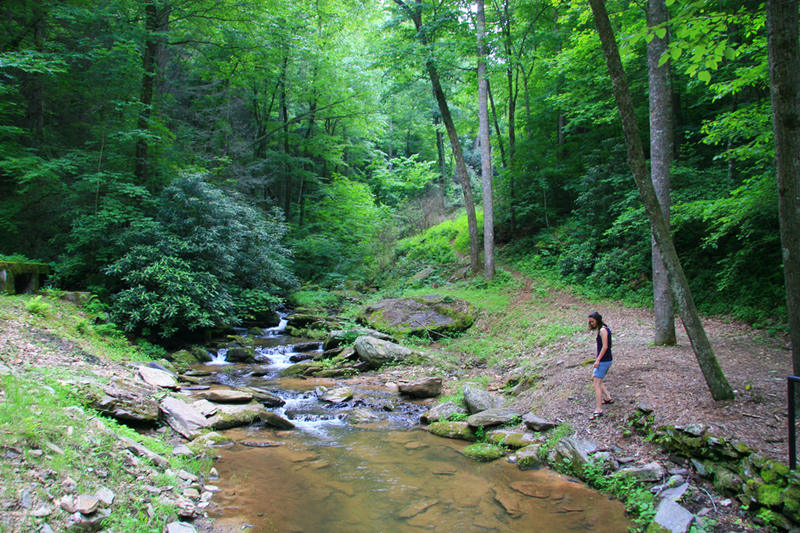 There was also the ever-present sound of the creek as the water tumbled among the rocks. Above it, between the steep mountains and towering trees on each side, peeked the blue sky. I walked along the right side of the creek towards the wooden bridge. 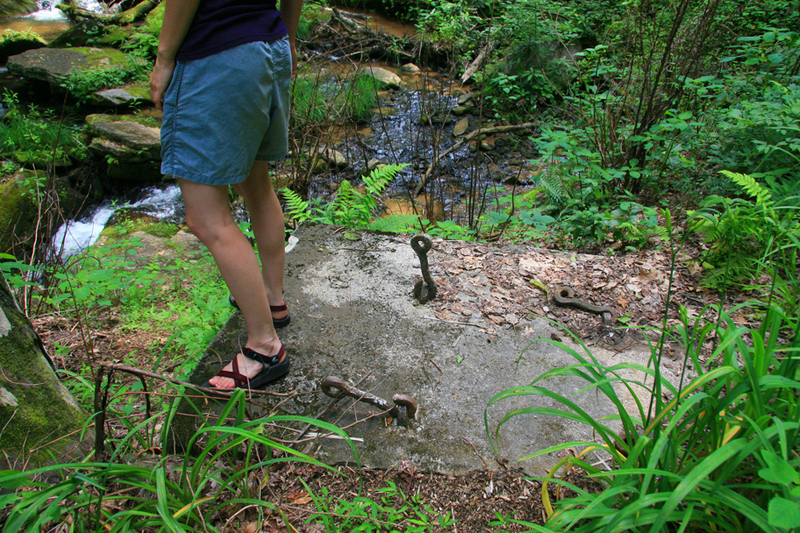 There was a spring covered in stone with fresh water bubbling out of the side of the mountain, a barbecue stove that I would be assigned to whenever Dad decided to have a business ‘gathering,’ and a shed for wood. On the other side of the creek, across the bridge, stood the cabin. The main part was in front and to the right, the porch, and the kitchen to the left. An open stone patio stood in the front, in between the two main halves of the building. The round logs were chinked with cement. It had a shingle roof. The back of the beautiful stone fireplace and chimney, which was on the end wall of the living room stood, directly in front of me as I stood facing the building. 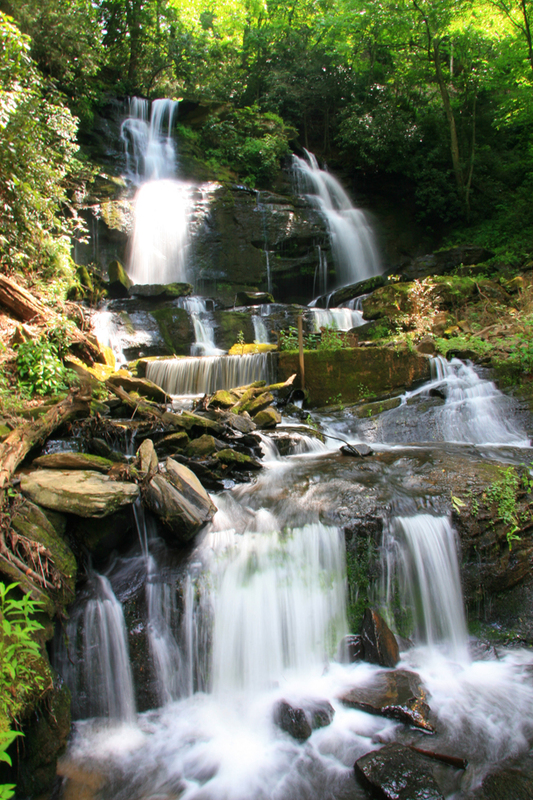 Once across the bridge, as I looked up the valley, I saw the beautiful twin waterfalls of Shoals Falls standing out against the blue sky with its flaky white clouds. 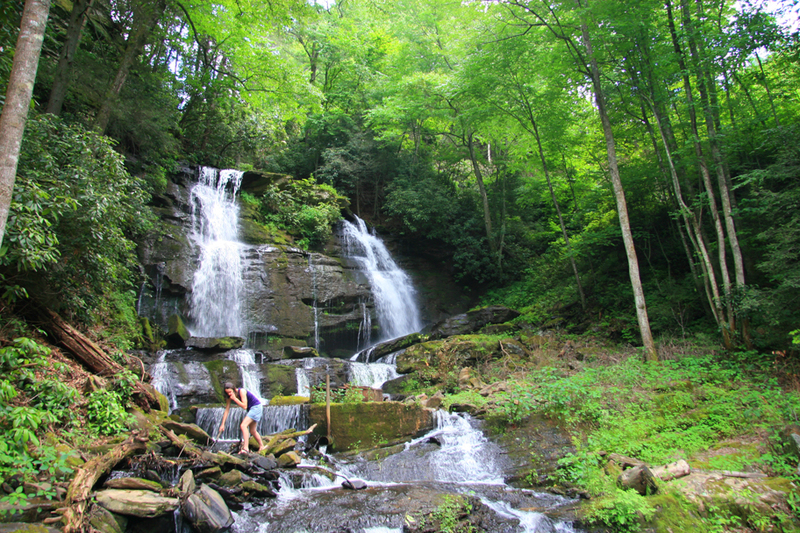 Below the falls, the water came tumbling down over the boulders and rocks of Shoals Creek into the pools of water with trout swimming about. 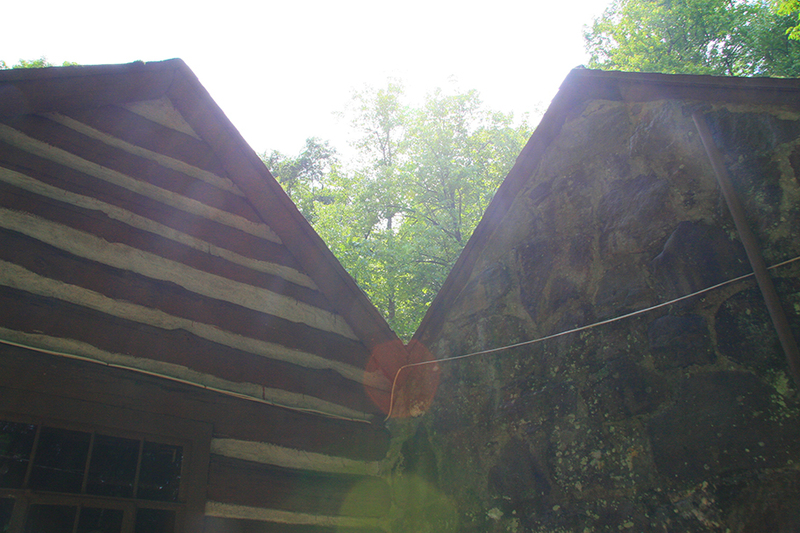 The gorge was so deep, and the mountains so high, that the only time sun reached the cabin was between 11 in the morning and 2 in the afternoon. What an ideal setting for the cabin. When I walked through the front door, the first thing I was struck by was the large picture window on the wall just across from the entrance, looking up at the falls. Wow! And just outside the window, between it and the creek, was a gigantic boulder. Imagine waking up just after sunrise and looking up at the falls staring down at you. It couldn’t be better. Just take a look at the floor plan. The living room/bedroom was spacious, perhaps 15 x 20 feet with a high, inverted V-shaped ceiling directly under the roof. Diagonally across the room was the back door that led to the woodpile just outside. That was probably one of the few functional elements of the design. A small window at the other end of the room, opposite the fireplace, looked directly into the side of the hill. More about the sleeping arrangements later. The rest of that part of the house is harder to describe. 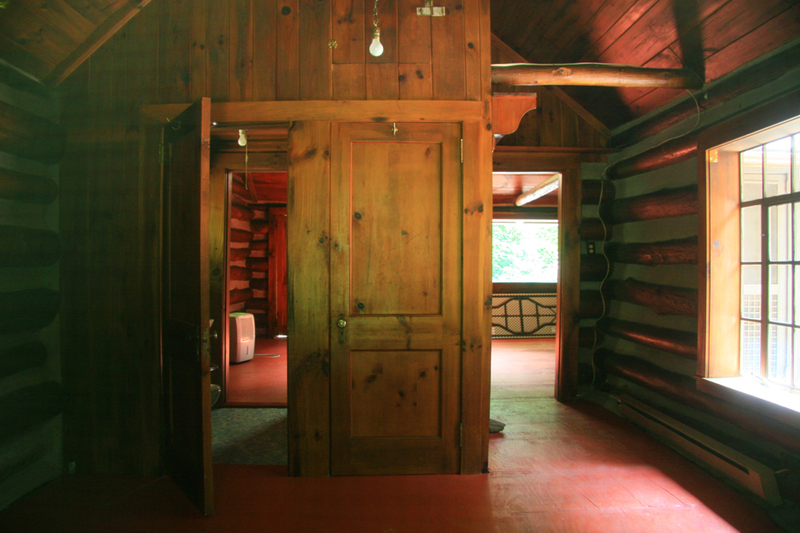 On the same side of the building as the front door, and opposite the picture window, were two doors that led into the other part of the cabin. Together, both parts created an L-shaped structure. The second room — well, sort of a room — was about 15 x 15 feet. The first door led to what can only be described as a hallway and closet. It had the only storage space in the entire cabin. The second door was to the bathroom with all the facilities including a shower. (Yes, we had indoor plumbing!) There was another door on the opposite side of the bathroom that led into the back room. 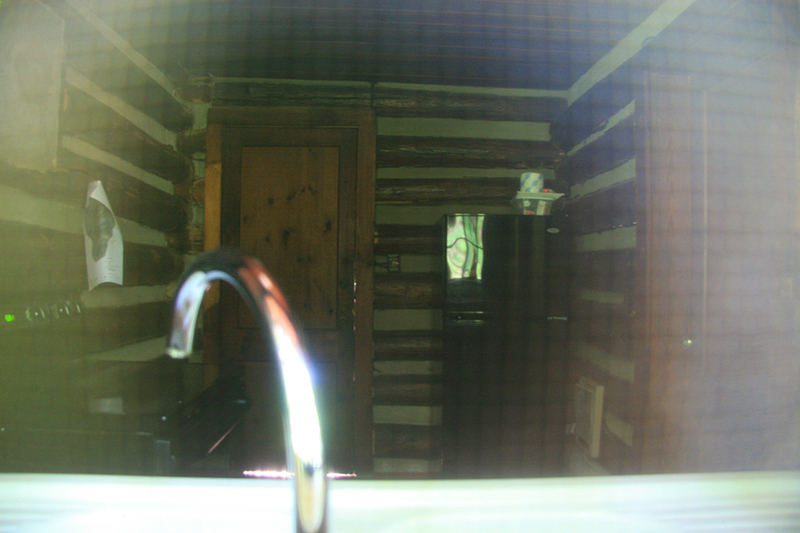 The bathroom had a window that, like its companion, looked into the side of the hill. There were two other windows. One of them looked out on the stone patio and across the bridge. One single bed and a bunkbed filled the room. Eventually, my father closed off the first door so that the only way you could get to the back room was through the bathroom. The kitchen was in a separate structure corner to corner with the back bedroom. Inside the U that the buildings formed was the open stone patio. Hot or cold, wet or dry, day or night, summer or winter you had to go outside to get to the kitchen. Admittedly, it wasn’t very far. Perhaps 15 feet or so. Oh, by the way, there was no roof over it. The kitchen was small, one might even say tiny. Perhaps 6 x 8. 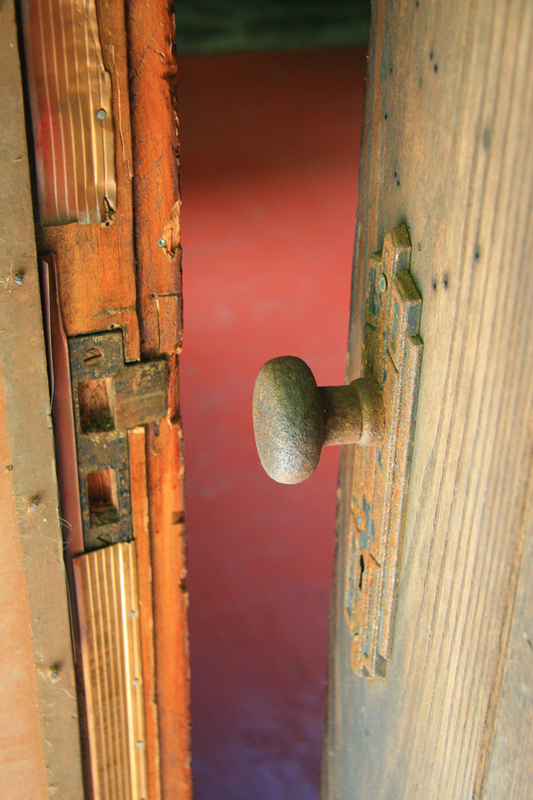 You entered through the door off the patio. Across from it on the far wall over the sink there was a window. The wall to the left had another door. It led to the 8 x 8 screened-in porch. It did have a roof, a large table with benches on either side and the refrigerator. Yes, there was electricity. Well sort of but you’ll have to wait for that part of the story. In the center of the kitchen was a small two-eyed wood-burning stove with an oven in the chimney. Thank goodness for my Boy Scout training. I was real good at getting it started up to a full blaze real quickly, even from embers. That is where all the cooking was done. Just to give you an idea of the size of the kitchen, the only other piece of furniture in it was a card table with a small wooden caned seat chair beneath. You can’t imagine how fast you can roast a whole chicken in the chimney oven with a full fire going in the stove. 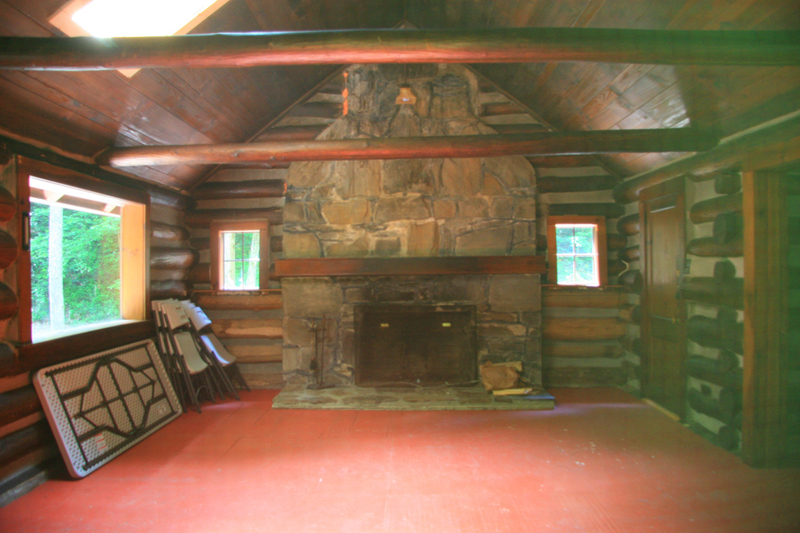 The fireplace served as the primary heat source in the living room. My father slept on the single bed under the picture window. There was a couch opposite it in front of the two doors; its back dropped down, converting it into my mother’s bed when she was there. My bed was on the wall under the small window by the back door. Admittedly, it was. The fire was going. Of course, I had gotten up in the middle of the night when the fire had burned down to embers. The room was cold, so I went outside where it was even colder (to say the least), brought in two loads of logs, and rebuilt the fire. That helped make it warm and comfortable in the morning! Let me tell you a little more about my Dad. He was a city kid, raised in Philadelphia. He had no prior experience with farming. He had an eighth grade education, was trained as a furrier, and took over New York Drop Cloth Manufacturing Co. when his father, who founded it, died. Dad took the business from drop cloths to tarpaulins, from tarpaulins to tents and then to other canvas camping equipment. During the 1930s any camping gear that had the Boy Scout label was made by my Dad’s company. Originally, Dad’s factory was located in a small second-floor loft at 148 S. Greene Street in Manhattan, in what is now called Soho. In 1939, he moved the factory to Long Island City. Working for the Boy Scouts was like a small company selling to a large one: the Boy Scout organization was in control, especially during the depression. Beginning in 1939 with Land Lease, and throughout World War II, the company (with its new name, Diamond Brand Canvas Products Co.) made canvas products for the military. Dad continued to supply the Boy Scouts as well, using surplus canvas. Eventually he moved the factory to Naples, NC, just north of Hendersonville and onto the farm. When I was 13, Dad broke his arm and needed my help around the factory. Starting then and for the next seven years, whenever I wasn’t in school, I worked in the factory or on the farm. I spent many, many days and nights throughout the year at the cabin. Much of the time I was alone. It was a delightful place, peaceful, quiet and always with the sound of rushing water. I learned the importance of quiet and solitude. I learned to be comfortable alone and with myself and how to take care of myself. 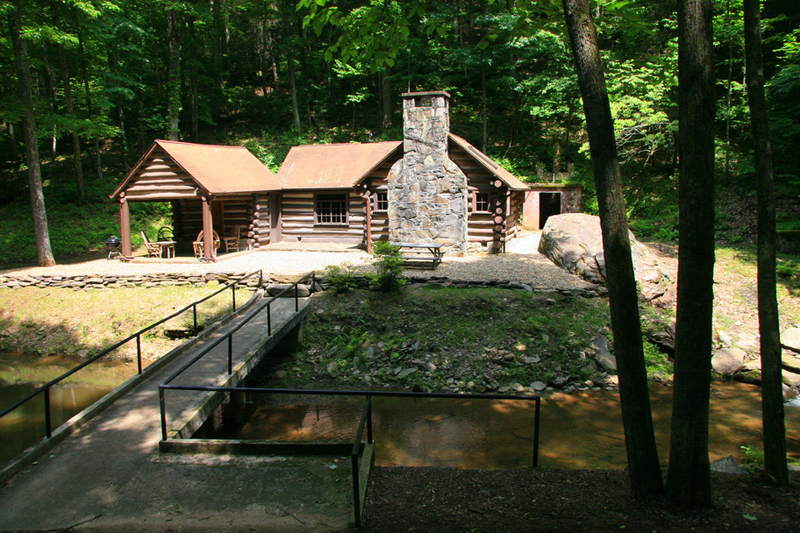 The cabin, with its view of the spectacular falls, became my quiet place — especially after my father bought out Jack Newton and the small holdings employing many of those who lived there and converted the hollow from Crab Creek Road to the mountains into a farm with 50 milking head of purebred Guernseys. But that’s another story. It took me much later in life to realize how important quiet time and quiet space are to me. What isn’t part of another story is what Dad did to “improve” the cabin without any understanding of its natural beauty, or how the changes he made affected it. Admittedly, the wooden footbridge eventually had to be replaced. Remember, no vehicles ever crossed over it. When Dad decided to put up a new one, instead of replacing it with the handsome one that fit into the setting, he put in a concrete bridge with galvanized pipe railings on heavy ceramic pipe pilings filled with concrete. Of course, it is still there today, maybe 60 years later. But it sure looks and felt out of place. See if you don’t agree. Just below the bridge he put in a concrete dam. Don’t ask me why, I haven’t a clue. I do know that beforehand the water bubbled its way on its circuitous path around the large boulders and rocks. It was a beautiful sight to see. If you paid attention you’d be able to watch the trout swimming around. And if you were of a mind, you could occasionally catch one and have it for breakfast. Aside from its affect on the appearance, the dam collected debris from upstream and underminded the creek wall by the parking area so that it had to be repaired. But that’s not the big story. When we first moved into the house we had electricity — of a sorts. It fired up the light bulbs, ran the refrigerator, heated the water and the baseboard heating system in winter. Admittedly, it was hit and miss. Dad decided to replace the water wheel and small generator with a turbine and much larger generator in a log shed he had put up just up the creek from the cabin. The turbine was powered by water from the falls. Remember it was over 200 feet above the cabin, and some distance away. The water had to be piped down the mountain. I’m not sure how large the pipe was, say, 12 inches in diameter. In order to get enough water, a concrete dam had to be installed at the foot of the falls and the pipe connected to it. To keep debris out of the pipe, the opening was covered with a screen. There was so much trash — falling branches, leaves, mud, etc. — that the pipe clogged up frequently — summer and winter. Someone had to clean it out. 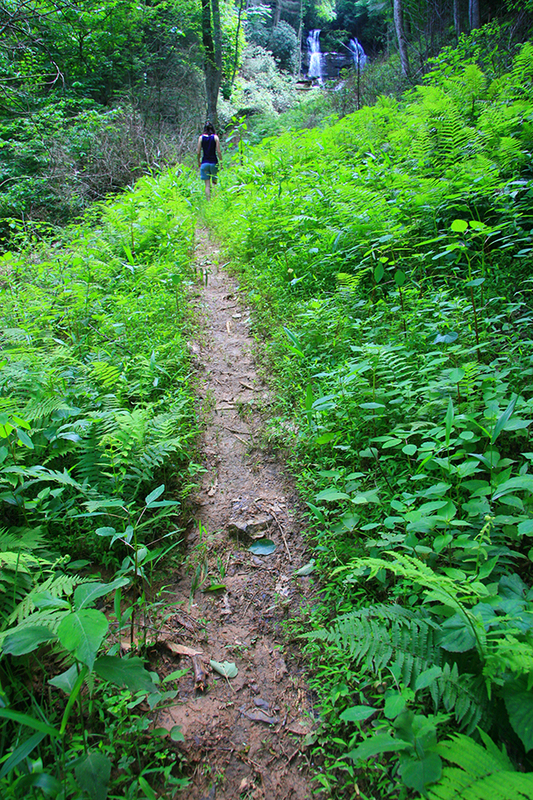 That was no easy task over slippery rocks on the steep slope high above the cabin. The “solution” was to put swinging bridges from halfway up the hill to the dam. Then when you looked up to the falls the view was obstructed by the shed, the pipe, the dam and the swinging bridges. The only problem was that the more powerful system didn’t work either, in part because the water pipe continued to clog up. 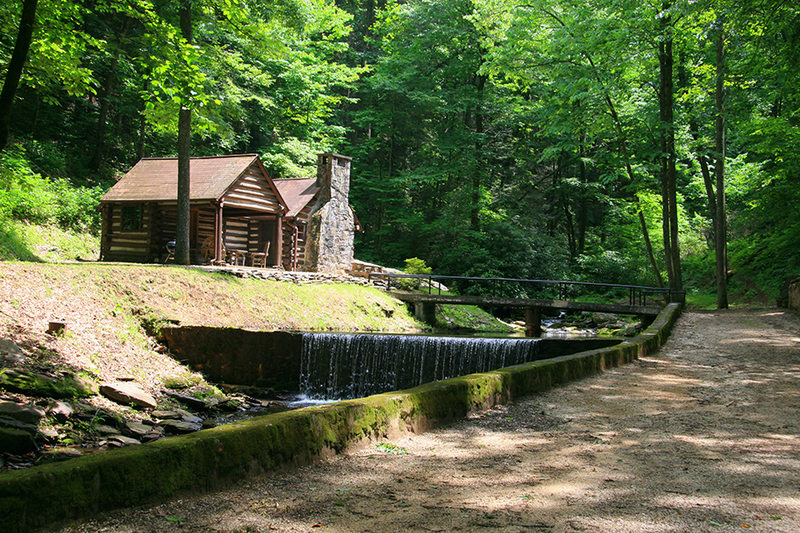 The answer was to get Duke Power to run a line to the cabin. They always supplied power to the farm. After that, the power supply was fairly reliable. What we are left with was the expense of installing and running power systems that didn’t work and the disruption of nature and beautiful vista it had to offer. The swinging bridges have deteriorated. So all that is left are some eyebolts anchored into the rocks, some cables, the dams, and the concrete bridge. To some extent nature has reclaimed the view. One important lesson I learned was: before you take any action, pay attention to its likely effects before you do anything. That is especially true when you are dealing with a complex system whose workings are not fully understood, like the ones we call the human body, the health-care system, the economic system, and nature. Regardless of whether you consider them or you don’t, you will be faced with the consequences. 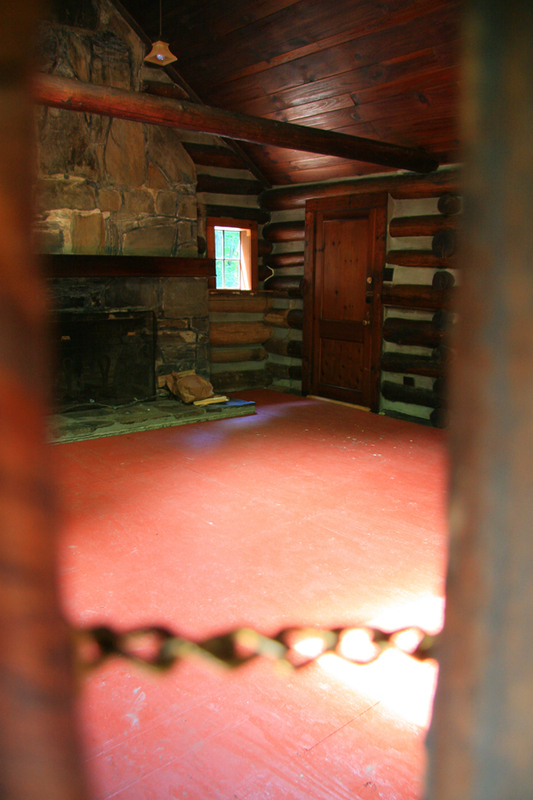 Your textured description of the log cabin brought me back there — not just to a place I had visited but to a time I had not experienced. And the lesson you learned is of universal importance. Well done, Bernie! I came across your blog today thru a Bing search for NY Dropcloth. I was searching for that because my mother was an employee during WWII in the Long Island City factory. She spoke fondly of your father I think. She used to tell us of the owner who was such a kind man and who appreciated the quality of her work – sewing. Often on her walk from “the Projects”, Queensbridge, he would stop his car and drive her the rest of the way to the factory. I have her employee badge, number 60 with her sweet photo on it. Another memory she had from her time at NY Dropcloth was sewing phrases like, “God Bless You” or “Come Home Safe”, etc in the bottom of the sea bags. She signed her bags with her name, Rosie. You come from “Good Stock”!